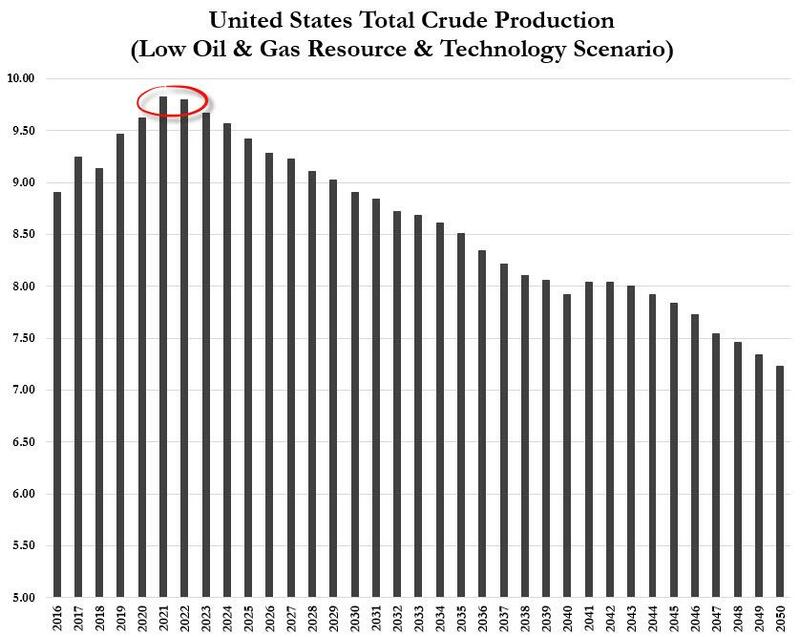 While the EIA is not predicting what will happen, it is modeling possible production scenarios under certain assumptions. Under one of those modeled projections—the Low Oil and Gas Resource and Technology case—the assumptions applied are lower resources and higher costs. In this model, U.S. tight oil production - including the plays Bakken/Three Forks/Sanish, Eagle Ford, Woodford, Austin Chalk, Spraberry, Niobrara, Avalon/Bone Springs, and Monterey - is expected to rise from 4.96 million bpd in 2017 to 5.59 million bpd in 2022, and then to start declining on a steady downward trend by 2050, when tight oil production is expected to be at 4.42 million bpd. Sure, longer-term projections are much more uncertain than shorter-term forecasts, and U.S. oil production will depend on many factors - oil prices, the pace of technological advances, costs, well productivity, and U.S. and global oil demand growth, to name a few. Everyone agrees that shale will grow in the near term - even OPEC, which admitted in its World Oil Outlook 2017 that U.S. tight oil will grow at least until 2025 as “drillers seek out and aggressively produce barrels from sweet spots in the Permian and other basins.” OPEC sees U.S. tight oil peaking in the latter half of the 2020s. In addition, growth will depend on whether drillers - who could soon start to test the Permian region’s geological limits - will be able to overcome the geological constraints with tech breakthroughs. If drillers can’t overcome the law of physics with technology, Permian production could peak in 2021, putting more than 1.5 million bpd of future production in question, and potentially significantly influencing oil prices, Wood Mackenzie has warned.